For years a distinguished family doctor has quietly and effectively helped his patients prevent or deal with diabetes, heart disease, and other problems through his Health First program, which teaches: mindfulness about health and diet; budgeting of food types through daily/weekly diet plans; a decrease in one’s diet of sugar, salt, and fat; and the adoption of regular, moderate exercise. Dr. Hirsch’s Health First program has a wonderful “triple bonus” for his patients: not only the prevention or management of disease, but also weight loss and wellness. Now, with the publication of this book, Dr. Hirsch has put his proven program, and its beneficial results, directly in your hands. “You can say goodbye to the diet fad of the month and say hello to an easy-to-follow program with wonderful, long-lasting results.” “A terrific, practical guide for anyone who wants to live within a consistent, healthier weight range forever … The big difference between this program and some fad diet or hyped training regime is that it is simple and sustainable. The program … incorporates reasonable weight-loss targets and will result in improved fitness levels.” –JOHN CLEGHORN, Retired CEO, Royal Bank of Canada ..”. Dr. Hirsch offers everyone the chance to take part in a program that has helped many of his own patients achieve healthier lives. 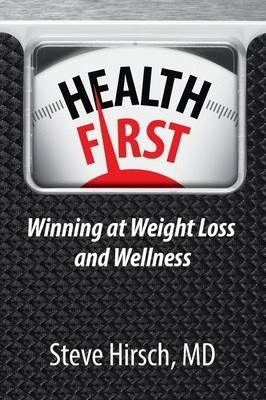 Well written, evidence-based, easy to read, and user-friendly.” –CAL GUTKIN, MD CCFP FCFP “After losing 25 lbs on this program, I simply cannot believe how much get-up-and-go I have! … The daily budget approach to food intake is a simple way of keeping on track without a lot of fuss. And with my busy life, fuss-free is the only way to go!” –MICHELLE, age 42 Steve Hirsch, MD CCFP FCFP, practices family medicine near Toronto and is a lecturer in the Department of Family and Community Medicine at the University of Toronto. Dr. Hirsch is passionate about leading a healthy life, which for him includes exercise, proper diet, and daily mindfulness meditation. Besides being an avid cyclist, he has run twenty-four marathons, including five Boston marathons.